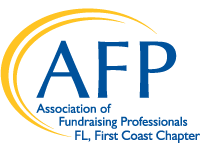 Each year, the Florida First Coast Chapter of the Association of Fundraising Professionals (AFP) honors donors, volunteers and professionals whose gifts of time, expertise and resources contribute significantly to the quality of life in our communities. This year’s National Philanthropy Day Awards Luncheon will take place on Tuesday, November 6th, 2018 at the Hyatt Regency in Downtown Jacksonville. For registration, sponsorship, and a list of past winners, please use the buttons below. National Philanthropy Day acknowledges the entire spectrum of services that the nonprofit and civic and service sectors provide, as well as the profound impact that philanthropy has on the fabric of society. This annual event is also a fundraiser for the Florida First Coast Chapter of the AFP to provide scholarships and educational opportunities to further individual members’ professional development.